Remember the game called Boggle? Well, since we’re now living in the digital age, it makes perfect sense for it to jump into the digital world as well. Known as Boggle Flash, this £24.99 purchase might just rekindle your love for word games yet again. 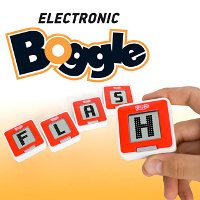 You can forget about carrying around boards, dice or sand timers since Boggle Flash comprises of just five LCD tiles, where eahc of them will display a random letter. The whole idea would be to line up the tiles to spell out as many words as possible in under two minutes – 90 seconds, to be exact. You also need not rack your brains to keep score or argue over words as you slide, swap and shuffle simply because Boggle Flash already comes with a clever recognition software within the tiles themselves. After each round, just join the tiles together and all of your correct words (from some or all of the tiles) will be totaled to deliver a final score. Great game. Really enjoy it. got it for christmas and have not stopped playing it! Yes its small enough to take in your hand bag. it has a tiny carry case!